The Lipton Elevator move was “conceived” in July of 2001 when I was contacted by Wayne Warkentin of Warkentin Building Movers regarding a potential joint venture. Wayne had received a query about moving a grain elevator located at Lipton, Saskatchewan. The following week we were planning to travel through Lipton en route to Calgary, Alberta for our summer holidays, and with Wayne’s approval I contacted the owner, Robert Keyser, to arrange to have a look at the project. The building was huge and heavy. The dimensions were 33 feet wide, 90 feet long and 95 feet high. The construction of the elevator consisted of 2×8 spruce for the bottom third of the height, then 2×6 spruce for the next third, and finally 2×4 spruce for the top third. There was a hallway from end to end down the centre of the elevator and cross walls every ten feet. I estimated the weight of the structure to be approximately 500 ton. The elevator was to be moved 25 miles along a provincial highway to the owner’s property in Markinch, Saskatchewan where it would be set up as a grain storage facility for Keyser Farms. I proceeded with our application to the Saskatchewan Department of Highways for the moving permit. I submitted our dolly layout and axle loading configuration which was approved pending approvals from the utilities – Sask. Tel and Sask. Power, and bonding of Minty’s Moving Ltd. to indemnify Sask. Dept of Highways for any damages caused by the move. Once these requirements were met, Saskatchewan Highways sent written confirmation that they would grant a permit at the time of the move, which was planned for February 2002 when the ground would be frozen to a depth of 8 feet and the potential for damage to the road would be minimized. With our approvals in hand, we started work on building the equipment for the job. We needed twelve hydraulic lift dollies with self-levelling capabilities plus an eight axle thirty-two wheel mechanically oscillating jeep and a single axle booster for the tractor. We also needed a larger jacking system to lift the elevator. We had most of the axles and steel to build the dollies on hand. In September 2001 we started with shortening the axles and the cams and remounting the brackets for the brakes. By the end of November this was completed, as was the majority of our house moving jobs for the fall. December 2nd is when we started building equipment in earnest. By the middle of February, 2002 we had completed the twelve hydraulic dollies, the eight axle thirty-two wheel jeep with a four directional oscillating front bunk that weighed 8000 lbs and had 600 lbs. of welding rods pumped into it, eight hydraulic toe jacks (100 ton, 5″ shaft, 10″ piston, 30″ stroke) and two control panels. With the equipment freshly painted and loaded we were finally ready to go do the job! 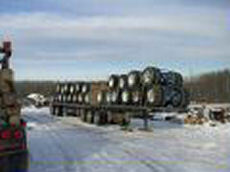 On February 27, 2002 we left for the job location which was located 200 miles west of our yard site in Onanole, Manitoba. We began the job by cutting holes in the side of the elevator at four locations on each side. The holes were cut 18″ wide and 10″ high into the 2×8 cribbed wall. The jacks were installed with toes inserted into the holes we had cut. We started jacking the north side with the four 100 ton jacks and found that the walls were anchored to the concrete. This was not something we had typically encountered when moving grain elevators in the past. With the hydraulic power coming from a PTO pump on our 92 Kenworth we had lots of power so we drove our Bobcat 873 with pallet forks attached, between the concrete and the bottom layer of 2×8 cribbed wall. We then had enough room to insert air bags to break it loose and continued to move the air bags down further until we had the outside totally free. We still had the problem of the centre walls being anchored so we set up four 50 ton jacks to free the centre and to give us lifting power to get the north side up approximately 16″. The cross walls and end walls were then blocked in about 6 feet. This gave us a counter balance which helped while freeing the south side from the foundation. We jacked the south side high enough to install our 107 foot main beams which were double 6″ x 18″ “I” beams spread 3″ with a solid 1″ plate on the bottom and a 3/8″ plate on the top running the full length of the beams. Each beam weighed 24,000 lbs. The main beams were installed using grader blades coated with Ivory soap and were spread 14’6″, centre to centre, leaving a footprint of 22 feet which was the maximum road width on our first major valley. We then went back to the north side and installed the north beam again using grader blades and soap. The owner had excavated the ground to 4 feet below the top of the foundation removing about 24″ of material at the base of the elevator and tapering off to nothing to be removed about 120 feet east. The land owner had four steel bins that were supposed to have been removed prior to the move and would have facilitated a straight move end ways. As they were not removed, we had to winch the elevator northeast making the loading of the elevator on to the dollies a little more complicated. By using several grader blades, we were able to move in two directions at the same time. We did experience a lot of resistance because of the sheer weight of the structure, but we just kept adding more winching power and anchorage and we able to overcome the weight to square inch ratio. (In the future, we would triple the number of grader blades). As we winched the elevator end ways we installed the dollies in pairs and continued with that process until we had enough room to install our big jeep which was equivalent to three dollies with no tongues, in length. We had hoped to do a load test on our new dollies, but it was accomplished in a different way than anticipated. As we were winching the elevator off the foundation we had two dollies connected together but the valve on one dolly was shut off. One of the dollies was climbing a small incline. With the increased height it ultimately took on more weight and as a result the oscillation post above the front axle collapsed. When we checked the pressure gauge on the damaged dolly it read 57 ton. We estimated that we had had 70 ton on the dolly before it was crushed. It was evident that we needed to reinforce the dollies, as well as to rebuild the one that had been damaged, which we immediately proceeded to do at the job site. Twelve sets of hydraulic dollies, designed and manufactured in our shop for this (and future) moves are shown here ready to be transported to the elevator site. As we continued to transfer the elevator from its foundation to the transport system, we recognized another problem. The frame to the neck connection of the jeep wasn’t strong enough. We had to unhook the tractor and force the neck back down and then reinforce the neck to give it sufficient strength. At last the elevator was loaded and ready to move – or so we thought. We found that with having two dollies completely behind the load we were too heavily loaded on the jeep, so we fabricated two crossbeams to fit between the two main beams. One was placed in line with the first line of dollies and the second one was placed in line with the fourth line of dollies. The two outside rear dollies were then placed under these crossbeams and were plumbed to their zone. We finally rolled out with the elevator being pulled by the prime mover on its own. We pulled it beside the neighbouring elevator to plug the truck in for the night. The next day we faced the challenge of learning to work with the new dollies. To begin, we made a soft left which was made with ease with dolly line four being secured to the mains with a tongue bracket, the front three lines chasing the big jeep, and line five chasing the secured line. Next we made a soft right 90 degree turn which was made with no manual steering. With the front bunk bolster of the jeep being 6 feet from the rear of the elevator, the wheel base was relatively short. The next big step was to cross two sets of rail tracks that were two feet above road grade level. With no hydraulic lift under the front zone (jeep bunk), this became a big task to keep the dollies from bottoming out or topping out. This is where the experience of a very close friend, Dave Scribner of Nebraska, paid off. Dave and one of his employees “Big Bubba” came to watch and provide their expertise in the use of the new dollies. Local Saskatchewan building movers, Jim Hakwich and Darren Stevenson, were also a big help with additional manpower and winching power to move the elevator off the foundation. When crossing the tracks we went as far as we could until the front line was about to bottom out and the rear line top out. We stopped and shut off all the dollies except the rear line. We blocked the beams at the back of the elevator, sucked up the rear line and shored under the dollies with 10″x10″x4′ blocks. Row four was then blocked with 8″x8″x4′ blocking. We advanced the elevator a bit further but we were still about to max the dollies out, so we proceeded to shore up the jeep with 8″ timbers. This process was very time consuming but it was very effective with no damage to the elevator, equipment, roadway or railway tracks. Our next hurdle was to make a sharp right 90 degree turn on to the main highway which was uneventful except for one of the dollies not wanting to track properly. We shut off the rest of the dollies in that zone and reset the dolly in line. It was Thursday and the move down the highway to the town of Markinch was scheduled to begin the following Monday. The loaded elevator was parked on the side of the highway in Lipton, barricaded and attended by flagmen 24 hrs./day for the week-end. The 25 mile move commenced on the morning of March 18, 2002 and it would include 2 large valleys and several super elevated curves. Although we had braking power on all of the axles on the dollies, on the first hill which was just two miles into the move, we used only the engine brakes of the pull and push trucks plus a quad track farm tractor in low gear. Going up the hill we had the two quad track farm tractors supplied by a Regina equipment dealer, up front and two push trucks on the rear. We kicked the prime mover out of gear for back-up power. Our prime mover was a 1992 T800H Kenworth powered by a 425 HP Caterpillar engine with a double under 8 speed transmission, a 1241C auxiliary transmission which we had just installed for the job and 56,000 lb. rear-ends with a 5:31 ratio. On the level, the 92 Kenworth was easily capable of hauling the elevator on its own. On the curves we had to fully elevate the zone on the low side and fully lower the high zone to compensate for the centre of gravity transfer. In spite of these adjustments, our 7″ hydraulic cylinders were at 2500 lbs on the low zone and were at 1000 lbs. on the high zone. We averaged a speed of 5 miles per hour when in transit and encountered several power lines along the route. The elevator travelled 18 miles the first day of the move. The load was parked on the side of the highway for the night, barricaded and once again attended by flagman overnight. Prior to reaching our final destination we had to move the load through a second valley. We used the pull truck engine brake, two push truck engine brakes and 10 lbs. of air pressure on all the dollies to provide braking power. The two quad farm tractors didn’t arrive in time to assist to pull the load up the hill but our three trucks handled the incline which was actually steeper than the first valley, with lots of power and gearing to spare. We arrived at the site by noon of the second day of the move and pulled the elevator on to its new foundation and blocked off the mains. 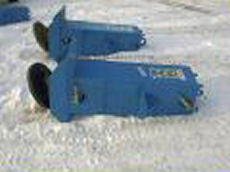 We then retracted the dollies and rotated them for easy removal. It was a big job to dismantle all the air lines and hydraulic lines but it was a much quicker process than installing them. The following day we lowered the elevator six feet – one side at a time with the mains being the pivot point. With the counter weight beyond the pivoting main the attached side hydraulic jacks lowered the elevator on to the foundation quickly and simply. As the jacks were attached to the walls prior to the loading of the elevator, we only had to handle them twice which was a real time-saver. The next day we loaded up our equipment and arrived home in time for supper!